You may be wondering what on earth a Buddha Bowl could be. 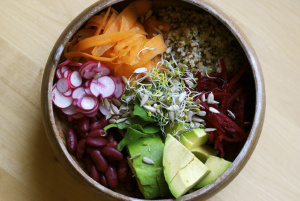 Such a basic concept really – a Buddha bowl is simply a meal-sized bowl filled with natural and pure wholefoods, which is enjoyed mindfully, and with deep gratitude. These deliciously wholesome bowls of food, typically include a variety of veggies, healthy fats and vegetarian protein. They don’t have to be 100% warm or cold, in fact one of the wonderful things about these bowls is the variety of temperatures and textures they include. Buddha bowls welcome creativity in the kitchen, and provide an opportunity to experiment with combining various wholefoods to create a delectable flavour explosion, that nourishes the body, mind and soul. Another distinct element of the Buddha Bowl is the dressing or sauce. A great sauce for your Buddha bowl is some variation of tahini sauce. I also really enjoy Thai peanut dressings or creamy ginger dressings, made with coconut milk or cashew cream. Start with a Base Layer of Greens: First, use an abundance of raw organic greens to fill the majority of the bowl. My personal favourites include kale, sprouts, microgreens, rocket and watercress, which are packed with vitamins, minerals, antioxidants and fibre. Add a Variety of Veggies: Next, add in as many raw or steamed veggies as you like or have available. Mixing textures and variations in taste can be an enjoyable and relaxing creative process: crunchy, sweet, bitter, juicy…go mad! Top with Grains, Nuts & Seeds: Great rain options include quinoa, millet or brown rice. Other I also love to include walnuts, pumpkin seeds or ultra-nutritious chia seeds. Dress with Your Favourite Sauce/Dressing: This final touch is the best part and can be as varied and interesting as you would like. Drizzle your favourite olive oil and vinegar, or splash tamari and lemon juice, add finely chop garlic, scallions, mild or hot peppers, sprinkle sea salt, nutritional yeast, or cayenne … Dressings can be anything from a light soy and ginger, to heavier tahini, or coconut milk based dressings, if you feel like something creamy. Be sure to use healthy wholesome ingredients in your dressing too. Eat mindfully enjoying all the flavours and textures: Discover what feels nourishing to your body, concentrate on tingling your taste buds! And of course, remember to enjoy with gratitude!